Writer Brent A Harris, was challenged with writing a 2,500 word story based on randomly assigned genre (Historical Fiction), subject (Twins), and character (a jewelry designer). This was his first round submission, about an elderly jewelry designer who must fashion the perfect set of twin crowns for Rome’s co-Emperors, under penalty of imprisonment. But she knows power isn’t so easily shared. There were 2100 entrants. Only 300 will make it to the next round. Does this story have what it takes? Her tired hazel eyes focused as well as she could, shifting her gaze over each of the guards. Four of them. That seems a bit excessive. Had they seen the designs? Have they come to imprison me already? The box was laid on the table so gently that it didn’t make a sound as it settled. The Praetorians, their job done for the moment, turned and marched out the door, save one, who stood resolute by the table, his young face passive, dark eyes wide open—alert. The lone guard did not answer. The guard turned his head and faced her, but for a long moment, he only returned silence, as if weighing the decision to speak carefully. Finally, he said, “Tacitus.” And that was all. Tacitus turned, breaking his military bearing, as if realizing it was no use ignoring the old woman any longer. He examined the crate, wedged his fingers under the lid, and pried open the box. A moment later, the lid was off, laying on the floor. And Tacitus resumed his guard. Silvia noticed Tacitus was careful not to look into the crate. Maybe he assumed it was a secret. Maybe he really was too blind to anything outside his duties. Whatever the reasons, Silvia dismissed them for the moment as she took a look for herself. Inside were twin bundles wrapped in purple velvet. She assumed each of those bundles held the silver crowns she had designed, arrived fresh from the silver-smith for use in the ceremony later today. She had only to approve the work. But it wasn’t that simple. She was sure, based on the past abuses by the elder Emperor, that any flaws in them, any variances or qualities found not to his liking—would result in her sudden, swift imprisonment—or even death. Not that it mattered. She knew what was contained within each of those bundles. It wasn’t just a crown, but her act of defiance. Her death would arrive swiftly enough. She knew the outcome of this no matter the quality of her work. Even so, she picked one up and carefully weighed it in her hand. Tacitus let out a quiet grunt. 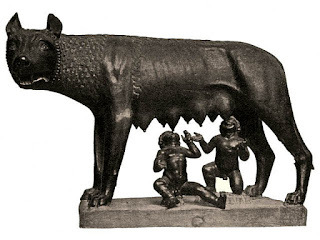 Then, as if recalling a childhood memory, he started: “Romulus and Remus were twin brothers, sons of Mars, suckled from infancy by a wolf, and raised as shepherds by a couple who came across the children. When they came of age and discovered their true lineage, they each sought to found their own city to rule. Shortly thereafter, Remus died, and Romulus founded the city of Rome.” He breathed out a sigh of exasperation as he finished the recitation. Tacitus turned once more to silence as Silvia set the crown down with a thud on the table. Next, she grabbed the second crown and set it down. That too, thudded on the table, louder than the first, knocking it to the side a bit as the second came to rest. “What I would like to know, in the origin story, is if Romulus killed his brother by his own hand—or if he had armed men, perhaps his own guard, carry it out.” She looked up at Tacitus and was not surprised to see a wall of stillness there instead. She turned her attention back to unwrapping both silver crowns. Her planned designs mirrored the final jewels in front of her in every detail. Perfect. “Tell me, what brother do you favor, Tacitus?” Silvia knew that her question was vague. Tacitus could have been thinking whether she meant Romulus and Remus, or the current Emperors, Caracalla and his younger brother, Greta. She could see him churning it behind those big brown eyes of his. Just then, Silvia heard sounds of hard leather boots hitting the stones outside, and the clicking and banging of metal breastplates and leg-guards. A moment later, she saw them through the doorway and open windows: several formations of Praetorian Guards, moving swiftly down the road. Tacitus looked as if he was unsure whether or not he should be going with them. So, Silvia simply brushed past him on the way out of the shop. In response, he followed. She stepped into the grey haze and watched as the soldiers winded through the narrow stone street, uncaring where their feet fell, some going through puddles of filth that the sewers had not caught since the last rain. Silvia presumed they were rushing to the palace. The Praetorians quickly disappeared down the path and out of sight as neighbors came out of their shops and homes to speculate and spread gossip. “We should go back inside, protect the crowns,” Tacitus said urgently. So, Silvia realized, Tacitus was indeed here solely to protect the silver and jewels that I had designed and not to bring me in—not yet anyway. The Emperors were still unaware of her defiance. Though they would know soon enough. And she would be brought in, tossed into darkness, never to see the light again. She’d accepted that. Though now that the hour drew near, her throat had gone dry and her palms slick. But Silvia already knew and she suspected Tacitus did too. In truth, she hadn’t expected it to be this soon. After the ceremony perhaps, though certainly not before. She eyed Tacitus carefully, wondering what the Praetorian truly knew about the events that had just transpired. His eyes had betrayed something just then, but she did not know what. She had a feeling that Tacitus’ men would be back, sooner rather than later. She hadn’t much time. She walked over to the twin crowns, examining them under a new light. Instead of the usual Corona Radiata of bronze or silver leaves, she had designed both of the crowns in the shape of two silver wolves, modeled after Romulus and Remus. The two sons of the she-wolf. Garnet, the crimson color of blood, was inlaid for the eyes. One wolf was whole, snout, jaws, four legs, and a tail. But in its jaws was half of the second wolf; two wolves, one devouring the other. “I told you my son had died. But I didn’t say how,” she whispered behind her shoulder to Tacitus, who was staring outside, as if impatiently waiting for his fellow soldiers to return. Tacitus did not respond, but she knew he was listening. So, she continued, “He was a soldier in the legion, out in Northern Britannia. He died defending the Emperor and safeguarding our existence here in Rome.” She wanted to cry, to let her feelings rage. But her tears had dried long ago. All she had now was her craft. She slammed Caracalla’s crown down on the table. The motion knocked Greta’s to the floor. It hit loudly and clanged as it spun—two wolves chased each other, until the crown’s circular motion ended abruptly with a dull ring on the solid floor. The moment she had been dreading all morning was finally here. Now that it was, she wanted to resist. To see the December sun set one last time. But she knew she couldn’t. She knew the rest of her life, short as it was, would be spent underground. If she resisted, she would only suffer more. She would not give them the satisfaction of harming her pride or her frail body. “I will go peacefully,” she said, eyeing the two guards sternly. Tacitus took the Emperor’s crown, wrapped it back in the purple velvet, while the fourth soldier took the other crown away for destruction. As Silvia was being led off, Tacitus stopped her. You can follow Brent A. Harris - and his adventures in the contest - on Twitter here.